There are so many things I like about today's APOD! There are the brilliant colors, of course, and the blue, blue glow of S Monocerotis, also known as S Mon or 15 Mon. Note the cavity that O-type star S Mon has blown around itself. It resembles the cavity that the cluster NGC 2244 has blown around itself inside the Rosette Nebula. The Rosette Nebula. Photo: Evangelos Souglakis. The Cone and Fox Fur Nebula. 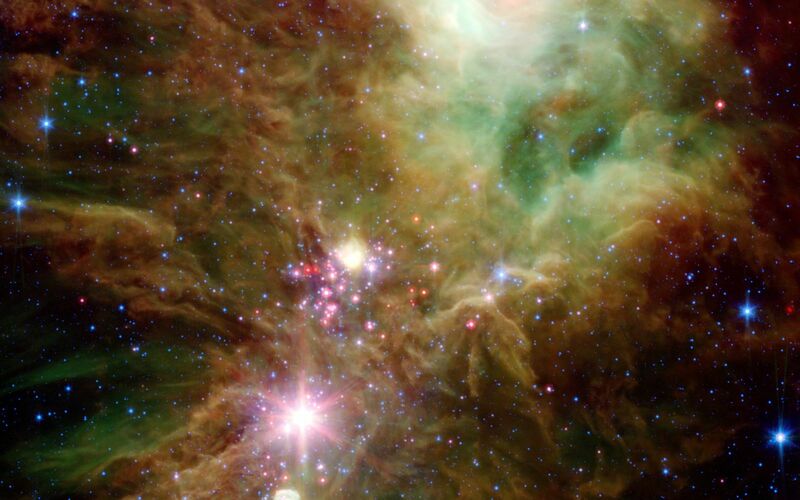 The clusters NGC 2244 in the Rosette Nebula and NGC 2264 in the Cone Nebula/Fox Fur Nebula complex may be of similar ages. 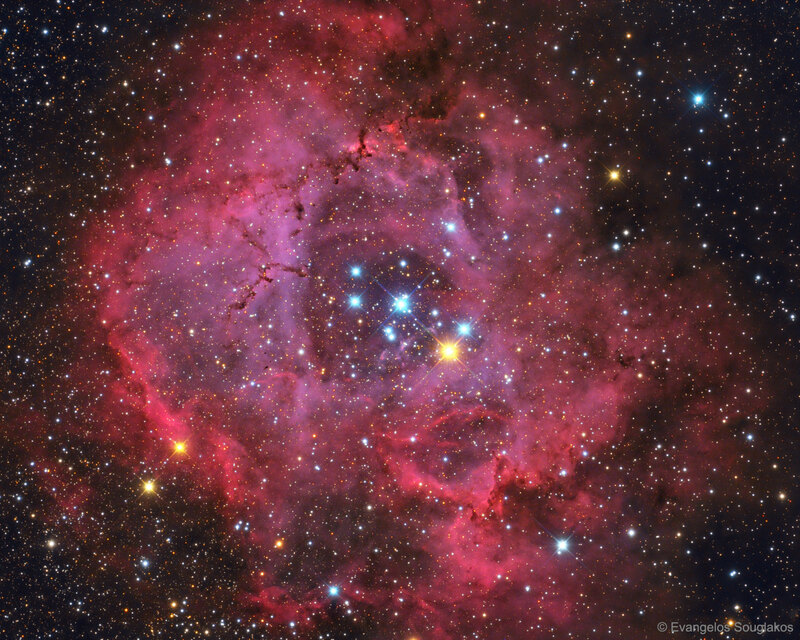 Wikipedia claims that NGC 2244 in the Rosette Nebula is less than 5 million years old, but it offers no age estimate for NGC 2264. That may be because star formation is still going on in NGC 2264. But this ArXiv source mentions in passing that NGC 2264 is 5 million years old. My point is that the NGC 2244 cluster in the Rosette Nebula and the O-type star S Mon in NGC 2264 are at similar stages of evolution, and both have blown cavities around themselves. The main difference is that the NGC 2244 cluster contains a lot more mass and power than S Mon does all on its own, so the Rosette Nebula is much brighter than the Cone Nebula and Fox Fur nebula complex. 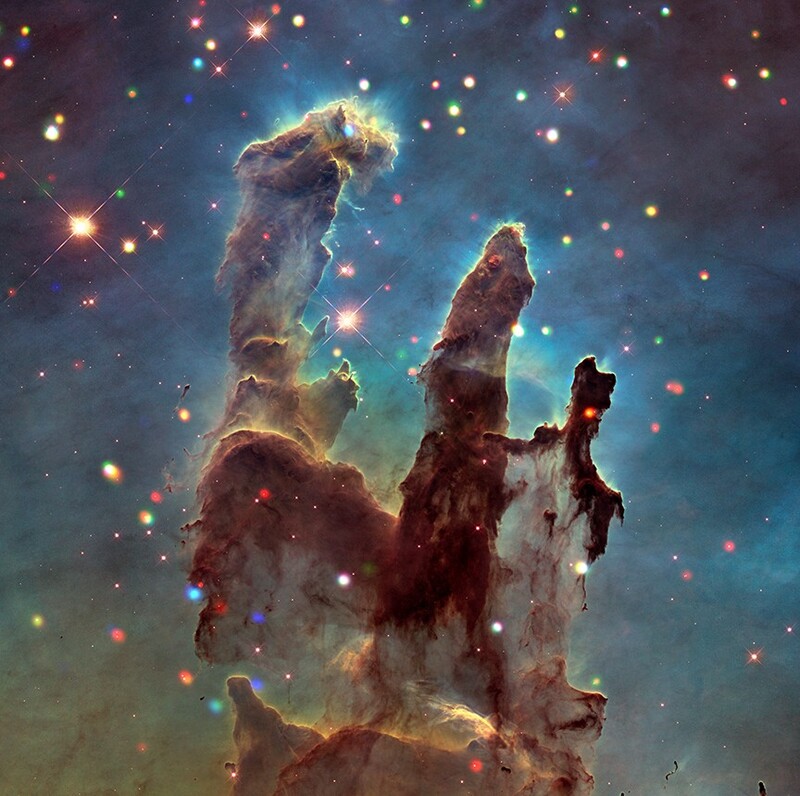 It is very interesting to compare the appearance of the NGC 2264 complex in visible and infrared light. In infrared light, a lot of fresh star formation is revealed. Take a look at the picture at right. You can probably make out the whitish tip of the Cone Nebula (at about 8 o'clock) and the ghostly shape of its walls. Just above the Cone nebula in the picture at right, there is a brilliant, pinkish-white star. What is that? Take a look at the visual-light picture at left. There is a bright blue star just above the Cone Nebula, but a blue star will not show up brightly in an infrared image. So what is the pink star? Look at the visual-light picture at left again. Can you see a tiny, tiny yellowish-grey spot just above the bright blue star above the tip of the Cone Nebula? That must be a site of star formation. And the brilliant pink star must be a moderately bright new star that is in the process of forming. 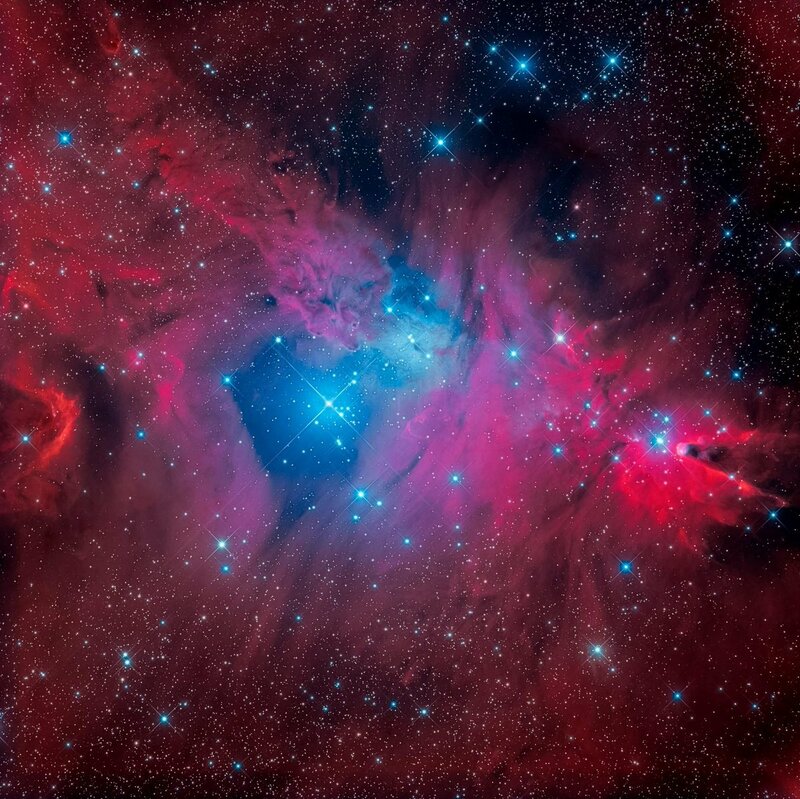 In the Vicinity of the Cone Nebula. And take a look at the APOD! The yellow light above the blue star above the tip of the Cone Nebula (well, to the right of the Cone nebula because of the orientation of the APOD) is very obvious. That is where you have your brilliant infrared-pink new star! And look at the "yellow stuff" in the APOD further to the right. Compare it with the visible-light image from ESO at upper left. Can you see, in the center of the image, some ghostly faint yellowish patches? They must be the obvious yellow "brush strokes" that can be seen in the APOD at upper center left. What are they? The Snowflake Cluster. Photo: Spitzer. Take a look at this Spitzer infrared image. At the center of the image, you can see a yellow patch surrounded by lines or "spokes" of pink or red spots. They are young stars still in the process of forming. The reason why they are forming such lines is that star formation typically takes place along elongated dust lanes. Waves of red Hα flowing away from S Mon. 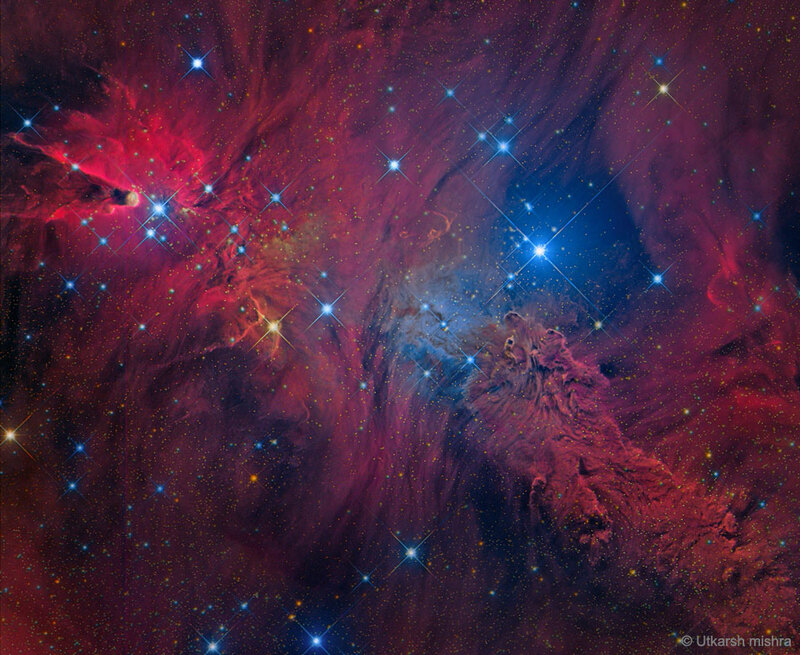 The APOD Robot said that the formation of the Cone Nebula was a mystery. In my amateur opinion, the Cone Nebula is simply a "pillar of creation", sculpted by the powerful stellar wind of O-type star S Mon (and enhanced by the stellar wind of B2III star HD 47887 right next to the tip of the Cone Nebula). Take a look at the somewhat blurry image at left. What I like about it is that it underscores the cavity around S Mon and the red hydrogen alpha shock fronts formed as the gas blown away by the star collides with dust concentrations some distance away from it. The Cone Nebula is probably the ionized remnant of a very dense dust concentration, perhaps a somewhat broad dust lane. Finally, take a look at the Hα-rich portrait of the NGC 2264 region at right. What I like best about Burley Packwood's image is the millions of small orange stars scattered all over the image. The huge numbers of tiny orange stars are obvious in the APOD, too. What are the yellow dots in the picture? I like this area; but, I always have trouble locating the unicorn! Last edited by orin stepanek on Tue Apr 16, 2019 3:45 pm, edited 1 time in total. Hey, Guest! I just tried to explain. The yellow dots are millions of small red stars in the area. They are so much smaller, fainter and redder than the bright young mostly blue stars in NGC 2264. 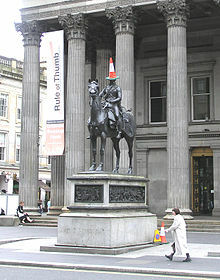 The Wellington Statue in Glasgow with traffic cone. <<Traffic cones, also called pylons, witches' hats, road cones, highway cones, safety cones, channelizing devices, or construction cones, are usually cone-shaped markers that are placed on roads or footpaths to temporarily redirect traffic in a safe manner. Traffic cones were invented by Charles D. Scanlon, an American who got the idea while working as a painter for the Street Painting Department of the City of Los Angeles. The patent for his invention was granted in 1943. In the United States on May 1, 1959 the Pacific Gas and Electric Company in Oakland, California adopted the policy of placing the orange safety cones at left front and the left rear corners of their service trucks while parked on the street to increase visibility and safety for the workers. This policy was implemented as the result of a suggestion by their employee, Russell Storch, a cable splicer. He was awarded $45 for his suggestion. This policy is still in use today. Although originally made of concrete, today's versions are more commonly brightly colored thermoplastic or rubber cones. Recycled PVCs from bottles can be used to create modern traffic cones. Ah ha! The cone is there to keep star ships at a safe distance. I guess they are only a problem for cars!